Learn More About One-N-Done Cage Mills! Save More With One Stage Cage Mills! 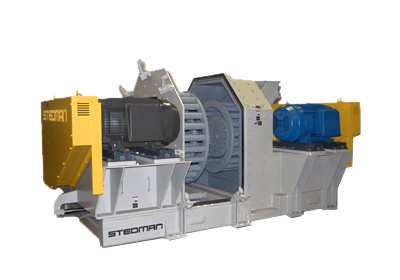 Each H-Series Impact Mill housing can accommodate two-, four-, or six-row cage assemblies. This versatility is further enhanced by the capability to vary the number of pins in each row, to vary the rotational speed of each cage in relation to the other(s), and to change the relative direction of rotation of the cages. For wet material applications, air cannons are mounted at the intake and discharge to help prevent buildup of wet material. A hydraulically-operated, quick-opening retractor provides rapid access to crushing components for inspection or changeout. The quick opening feature allows prescheduling of downtime for parts change out based on regular inspections. Inspection requires about five minutes, complete change-out of wear components as little as one hour, or less, compared to 10-hours or more on other mills. Capacities vary depending on feed size, feed rate, operating conditions, desired product output, characteristics of feed material, and equipment configuration. The Stedman Testing & Toll Processing Facility is the place to test your material in our full size equipment. If it can be crushed, ground, pulverized or mixed, chances are we’ve done it. Schedule your product testing in our H-Series today. To learn more about what to expect from testing, read this article that ran in POWDER BULK ENGINEERING magazine.